British pharma giant GlaxoSmithKline joined the recent groundswell of high-grade corporate bond issuers Monday to sell new debt. The UK-based firm priced US$3.5bn worth of ‘A’-rated, three-, five- and 10-year notes to help pay for its estimated US$5.1bn purchase of oncology-focused biopharmaceutical company Tesaro. The deal repositions GSK into the oncology arena after offloading that business to Swiss multinational pharma Novartis in 2015 for around US$16bn. The UK pharma’s merger with Tesaro is aligned with recent trends in the pharmaceutical space, as companies have been generally employing M&A to combat expiring brand-name drug patents, as well as to bolster innovation as technology advances. British pharma GlaxoSmithKline (NYSE: GSK) joined the recent groundswell of high-grade corporate bond issuers Monday to sell new debt. GSK said in late January it completed the acquisition, which aims to accelerate the build of its pipeline and commercial cancer treatment capabilities. The deal repositions GSK into the oncology arena after offloading that business to Swiss multinational pharma Novartis (NYSE: NVS) in 2015 for around US$16bn, as part of three-part deal with the company. Under the terms of that transaction, GSK acquired Novartis’s vaccines unit for roughly US$5.25bn, and established a joint venture with the firm, granting GSK majority control and an equity interest of 63.5%. However, Fitch said it expects the acquisition of Tesaro to increase its net leverage to levels incompatible with the agency’s ‘A’ rating on the firm in the short-term. Fitch had observed that “GSK's leverage headroom was already limited,” after its US$13bn acquisition of Novartis's stake in their consumer health JV in April 2018 spurred a downward revision to its outlook to negative from stable. Fitch anticipates funds from operations (FFO) lease-adjusted net leverage to remain at or slightly above 3.5x over the next three years, above its 3x sensitivity for a negative rating action. Tesaro is expected to be loss-making until 2021 and accretive to earnings in 2022. GSK’s three-part note deal was jointly lead-managed by BofA Merrill Lynch, Deutsche Bank Securities, Goldman Sachs and HSBC. The transaction follows New York-based pharma giant Pfizer (NYSE: PFE)’s US$5bn bond sale earlier in March after also agreeing to form a joint venture with GSK, with a focus on pain relief, respiratory, vitamin and mineral supplements, digestive health, skin health and therapeutic oral health. Meanwhile, the UK pharma’s merger with Tesaro is aligned with recent trends in the pharmaceutical space, as companies have been generally employing M&A to combat expiring brand-name drug patents, as well as to bolster innovation as technology advances. GSK, for example, has been facing pressure from generic competition for its profitable asthma inhaler Advair, as well as from HIV drugs launched by U.S. biotech firm Gilead Sciences (NASDAQ: GILD). The British drug-maker is also caught-up in the fray of increasing consolidation in the business of oncology care. Bristol-Myers Squibb (NYSE: BMY), for example, recently agreed to swallow-up cancer treatment giant Celgene Corp (NASDAQ: CELG) for an estimated US$74bn to bolster its cancer-fighting efforts after Celgene combined with Seattle-based biopharma company Juno Therapeutics (NASDAQ: JUNO) for about US$9bn to boost its oncology program. GlaxoSmithKline, for instance, intends to separate its JV with Pfizer as an independent company via a de-merger of its equity interest to its shareholders and a listing of the Consumer Healthcare business on the UK equity market. Against this backdrop, there was no shortage of demand for GSK’s US$3.5bn debt deal. 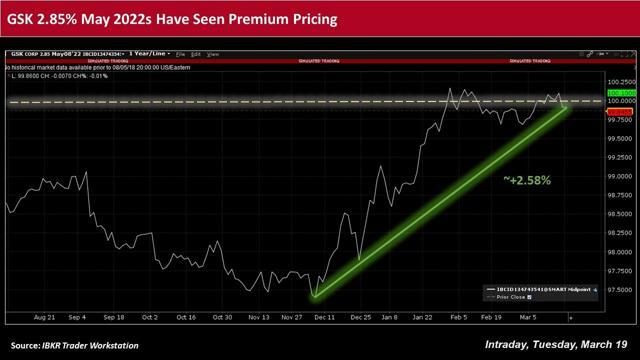 Cash spreads on the company’s three-, five- and 10-year tranches narrowed by anywhere from 15bps to 17.5bps over the course of pricing to arrive at 50bps, 70bps and 90bps more than matched-maturity U.S. government bonds, respectively. 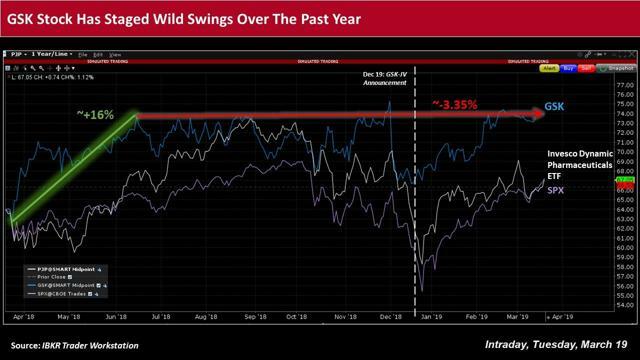 Indeed, high grade U.S. dollar-denominated debt continues to attract global demand for the yield offered in the primary market – especially among those bond buyers who have been priced out of their local markets or have a dearth of available paper. The yields on 10-year Japanese and German government bonds were last in the area of -0.053% and 0.099%, respectively, while the yield on the 10-year U.S. Treasury note was last around 2.610%. 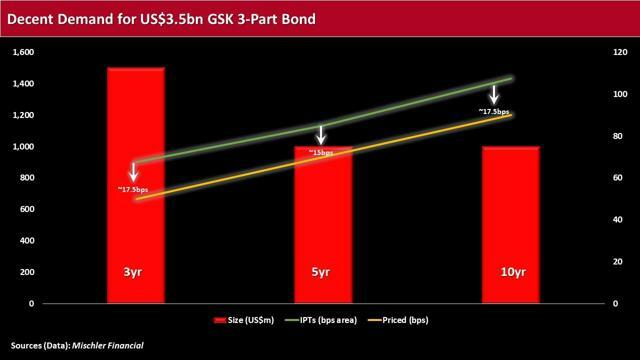 GSK’s notes due 2022, 2024 and 2029 were sold while their respective benchmark U.S. Treasuries were yielding 2.399%, 2.409% and 2.598%, with the latest tranches having priced to yield to maturity 2.899%. 3.109% and 3.498%. Moreover, fund flows continue to run hot for high-grade corporate bonds. For the week ended March 13, Thomson Reuters/Lipper U.S. Fund Flows reported a net inflow of roughly US$3.3bn into investment-grade corporate bond funds, while high yield funds posted net inflows of more than US$1.0bn. These figures followed inflows into high grade corporate funds of around US$2.0bn and US$3.9bn for the weeks ending March 6 and February 27, respectively. The healthy demand continues to lure issuers of corporate bonds to the primary market, especially amid still-low borrowing costs and broad expectations for the Federal Reserve to maintain its “patient” stance on resuming its course of monetary policy tightening at the conclusion Wednesday to its two-day meeting. GSK had contributed to a total Monday of nearly US$8.3bn of new investment-grade corporate deals, almost 36% of what most syndicate managers expect for the week, according to Ron Quigley, head of fixed income syndicate at Mischler Financial. Quigley furthermore observed at least 17 potential deals in the pipeline, including from Walgreens Boots Alliance (NASDAQ: WBA), Macy’s (NYSE: M), Microsoft (NASDAQ: MSFT) and Apple (NASDAQ: AAPL) – each of which recently registered debt securities-related automatic shelf filings with the SEC. Given the ongoing, low rate environment, the Fed’s dovish policy stance, and continued investor appetite for high quality corporate debt, the U.S. investment-grade primary market is likely to continue to churn out deals. Syndicate managers generally expect a total of around US$119.5bn in March, while, to date in 2019, a little more than US$293bn of new U.S. dollar-denominated corporate bond deals priced. Note: This material was originally published on IBKR Traders' Insight on March 19, 2019.